Since the closing of the Plattsburgh Air Force Base in 1995, Clinton County Government leaders and economic developers have created something impressive out of a difficult situation. 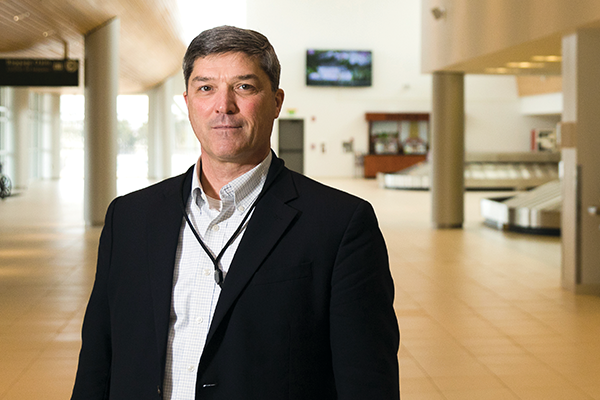 Leading the charge since 2011 has been Christopher Kreig, Plattsburgh International Airport’s director. Airports are both landlords and economic hubs and are almost always publicly owned and operated. Most are self-sustaining through rents, parking fees, food and beverage sales, as well as other sources of income. As with any business looking to grow in a stable and efficient way, the more diversified an airport’s income sources are, the more opportunity there is for growth. In New York State, aviation accounts for approximately $50 billion in economic activity. This includes around 400,000 jobs and $18 billion in payroll across the state, generating about $4.5 billion in state and local tax revenue. In our region, the impact of aviation is significant. Locally the industry has created approximately 300 jobs, $15 million in annual earnings, and an economic impact of $38 million annually. In January of 2017, PIA was awarded a grant of $38 million from the State of New York, one of only a few locations in upstate New York, including Syracuse, Elmira, Rochester, to receive funds. Prior to receiving this latest grant, Kreig and Clinton County leaders were working on a $55 million project that was scheduled to triple the size of the existing terminal. Today, that project is just about complete and passengers are taking advantage of the upgrades. “There was a time when you could walk out here [in the check-in area] and couldn’t easily determine who was waiting to check in and who was waiting in line for TSA. It was very congested before the expansion,” said Kreig. Now passengers enjoy a much smoother check-in process and TSA inspection with very little congestion. “There’s a lot more going on here than people think,” continued Kreig, referencing the extensive list of projects under way at the airport. Moving forward, the $38 million grant will be used to leverage additional funding from other partners (both existing and new) to take the airport to its next phase of development. 3) Leveraging partnerships to perpetuate growth in years to come. The recent expansion of the terminal has added value to the traveler experience at PIA. Aside from a smoother check-in process, the airport has a fresh, spacious look that provides a modern feel. However if one compares Plattsburgh International Airport to comparably sized airports around the country, there is one element to the traveler experience that remains missing. “The biggest complaint we hear is that there is currently no sit-down restaurant,” said Kreig. However plans are under way to build out a food concession space within the concourse that will include a 1,600-squarefoot “Taste NY” restaurant and retail space. Parking will soon be a major upgrade for the traveler experience as well. Currently, the main airport parking lot uses the old Air Force Base concrete, which has been worn down by years of plowing and salt exposure. The new parking lot will improve the parking experience for guests, as well as incorporate storm water improvements and electric vehicle charging stations. Food, retail, and parking are not the only upgrades travelers can expect to see at PIA in the near future. Transportation options to and from the airport will be upgraded as well with the construction of a new, 2,500-square-foot, multi-modal public transportation facility. One of the more significant projects under way is the construction of the new passenger boarding bridge and connecting corridor. This project will allow the airport to integrate an official U.S. Aviation Customs arrival zone within the existing Federal Inspection Services (FIS) space. The county has long sought to add international flights at the airport. Previously, the ability to support international flights was limited and contingent upon the availability of U.S. Customs officers. The addition of on-site customs at the airport will enable the growth of international commercial and general aviation operations. The airport is also taking steps to create a new access road, parking lot, and prepared site for the future construction of a hotel. The hotel site will likely be located to the east of the terminal in the open space next to the main parking lot and is expected to offer 80–120 beds. In addition, facility upgrades and new building construction projects are planned. A majority of the projects will take place along Arizona Avenue in buildings and property owned by Clinton County as part of the airport campus. Several buildings will undergo renovations to increase their functionality and value to potential tenants, such as the renovation of two 28,000-square-foot aircraft hangars, two multi-purpose buildings, and two industrial buildings. In addition, another nearby building will be renovated and converted into a car rental quick turn area (QTA), which is a space requested by rental car companies to quickly clean and prepare rental vehicles for use. There are plans to construct a new air cargo and general aviation customs facility as well. A big part of Kreig’s responsibility as airport director is to have the exploratory conversations that will identify the needs of potential tenants and border protection units. “When we have these conversations, we say, ‘Here’s what we have. What else do you need?’” he explained. If it can be done, Kreig and his team will do what they can to make it happen. The Adirondack Coast has benefited from a boom in development over the past several years. Companies continue to invest in the region, recognizing its growing reputation as Montreal’s U.S. suburb and a hub for the transportation and aerospace industry. In addition, recreation and sports are continued assets to the region’s culture and history. Recently, Lake Placid was selected to host the 2023 Winter World University Games and the Plattsburgh International Airport was named the exclusive airport for the games. Approximately 2,500 athletes will come to the region for 11 days, and most of those competitors will likely arrive through the Plattsburgh International Airport. “A lot of what’s happening in our region in terms of economic development initiatives comes back to the airport,” said Kreig. “Given our proximity to Montreal and all the other great things going on in our region right now, there certainly is a lot of opportunity here. The recent $38 million grant from New York State has proven to be a catalyst for growth at the airport. Without the grant, we never would have been in the position to do what we’re doing,” he concluded.